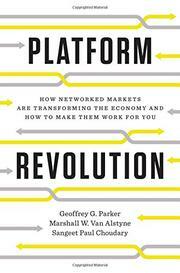 A platform, by the definition of business professors Parker (Tulane Univ.) and Van Alstyne (Boston Univ.) and Singapore-based analyst Choudary, is “a new business model that uses technology to connect people, organizations, and resources in an interactive ecosystem in which amazing amounts of value can be created and exchanged.” So value is created—not goods, not cures for cancer, but value, and most often in such a way that the people who own the platform leverage what other people own, be it a car (Uber) or knowledge (Wikipedia). In a mixed metaphor, the authors argue that platforms “beat pipelines because platforms scale more efficiently by eliminating gatekeepers.” Pipelines have shutoff valves and not gates, but never mind: the idea is that old-school regulatory agencies, editors, tax authorities, and other middlemen get out of the way of the transaction. The “positive network effects” thus achieved create the value, if they can be monetized properly—and how they’re monetizing out there, whether evading city hotel taxes in the case of Airbnb or using reputation ratings to vet babysitters in the case of Sittercity. The authors take their arguments on platforms beyond the business level to advocate delivering government services in similar form, as Singapore—authoritarian, ultracapitalist, and the authors’ seeming ideal—has done to some extent (though, they note, San Francisco, less authoritarian and less capitalist, has done even more). At the same time, they note the regulatory headaches the platform model induces, offering ideas for a “regulation 2.0” regime that encourages transparency while reducing inertia. In all this, it helps to have some background in the language and concepts of finance, economics, and business (“short-term micro-patent”), though that is not a barrier to entry. Sometimes dry, sometimes undercooked, but a useful snapshot of the rising new service economy—of considerable interest to students of business.